Associate Professor of Art Ben Moore (‘02) presents the paintings based on his sabbatical project to the United Kingdom in 2017. 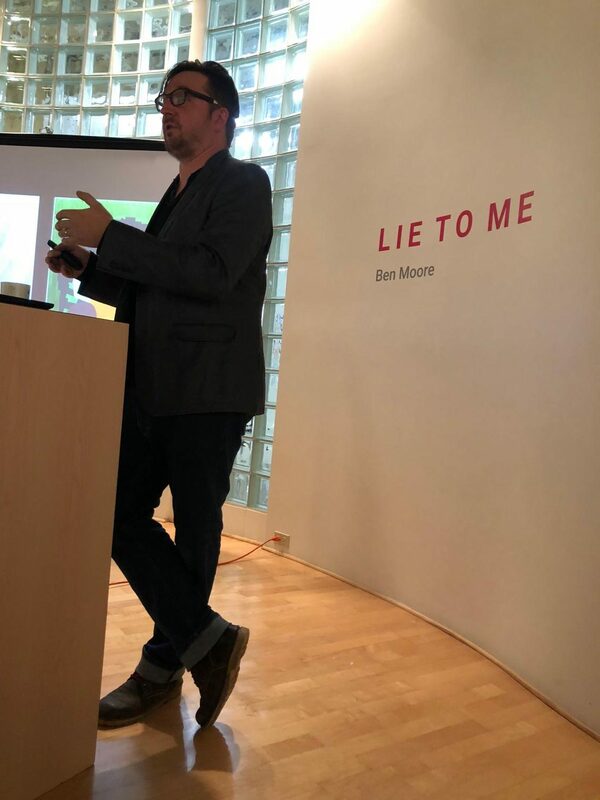 Associate Professor of Art Ben Moore (‘02) gave an artist talk about his show “Lie to Me” in the Wigley-Fleming Fine Arts Gallery in the Center for the Fine Arts on Thursday, Nov. 8 at 6:30 p.m. 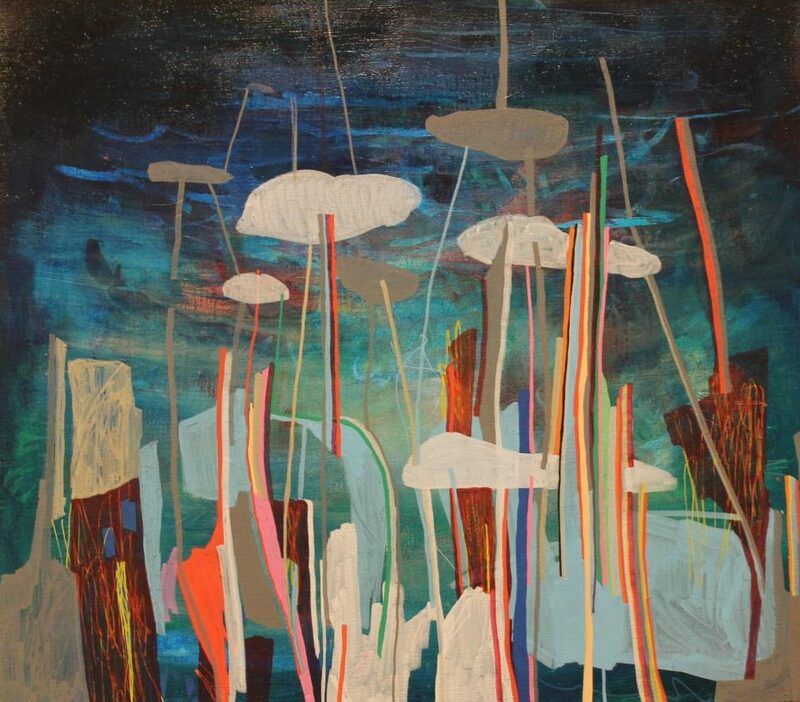 The paintings in his show were inspired by his sabbatical project in the United Kingdom in the fall of 2017. Throughout this series, Moore wondered how the supernatural can change our perspective and where the sublime exists in the physical world. His project explores how memory is conjured or experienced in outdoor spaces through these uncanny situations. Associate Professor of Art Ben Moore’s (‘02) work incorporated images and landscapes related to his time in the U.K.
For Moore, this meant staying in the tiny village of Woolage Green. His wife and two-year-old daughter joined him for the four-month sabbatical. They lived in a farmhouse with other artists, where Moore had his own studio in the rural countryside. Moore explained that the landscape was more than just rolling hills: There were cliffs and beaches, and they went on many research trips to the Peaks district near Nottingham on these trips. He would bring his sketchbook for journaling and also take pictures. He would then begin painting in his studio. According to Moore, he used the hillsides and the cliffs and did not ground them in any real space. By doing this, Moore created heavy natural formations that seem to float. He included racetrack ribbons into some of his paintings. On the weekends, he would attend motorsport races because one of the people they stayed with was a paramedic and did off-road racing. They also had a boat named BlueBell that allowed him to spend a lot of time on the canals of England. 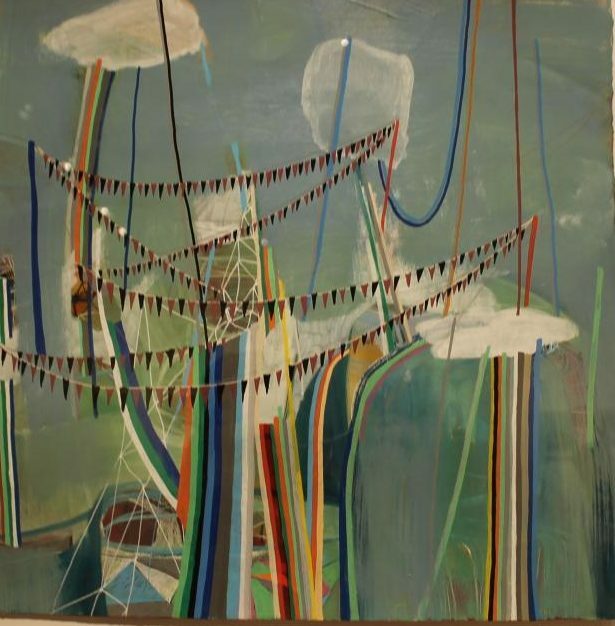 He features bits of the boat within some of the paintings, along with some images of things that remind him of Decorah. He thought about symbols that would break up the meshing together of cliffs and mountains. Moore recognized the sublime in places that were foggy, which he explained by relating it to how the world could drop off 20 feet from the viewer, and they would not know. Gerhard Richter was a painter who painted landscapes, which were absolutely sublime, according to Moore. When Moore was in the places that Richter depicted in his paintings, he tried to find the perfect, magical view. But with the sublime, it is something the viewer can never quite reach. Rainbows are an example of the sublime Moore highlights in his pieces. He moves them around as a formal element, making the rainbows pass behind hills or clouds. When they reappear, the color pattern is reordered. “Lie to Me” juxtaposes mountains and cliffs with race track ribbons. Moore described his paintings as clunky, using that as one of the parameters he had when he was making them. He wanted the formal decisions he made to make people laugh or feel odd because that is how he knew he was breaking out of the norm. Moore’s pieces in “Lie to Me” also showcase him diversifying his own artistic style, according to Adjunct Faculty in History Dalton Little. The next show to be displayed in the Kristen Wigley-Fleming Fine Arts Gallery has yet to be announced.